BRIGHTON, Mich.- Ford Motor Company surprised everyone this morning when the automaker Debuted the Ford Atlas Truck Concept at a Detroit Auto Show press event. This week we were all expecting Ford to give us a preview of the next generation 2015 F-150, but it now appears that this new Ford Concept Truck may be our first glimpse at the next F-150! Although, the Ford Atlas is referred to as a concept vehicle, it is possible that the truck could move into production with just a few minor changes. 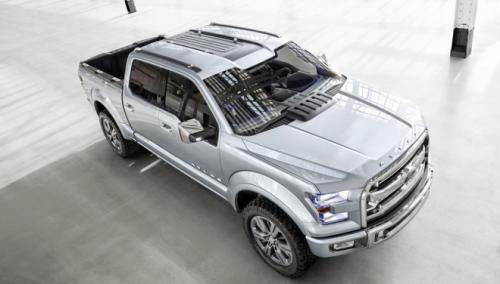 With a high-strength steel frame, evolutionary grille influenced by the current Ford F-150, and stacked headlights that resemble the Ford Super Duty, the all new Ford Atlas Concept Truck is just about ready for production. Although it remains a secret exactly which engine will be used to power the new Atlas, but Ford has hinted at a "next-generation EcoBoost". Not to mention Ford's new concept truck is loaded with new technology to make the truck more fuel efficient and useful to its owner. Your Washtenaw County Ford Dealership has all of the latest info from the North American International Auto Show! 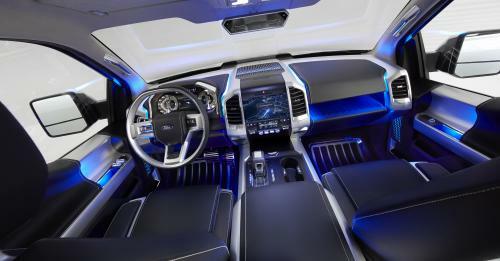 Stay tuned as we release more information on the Ford Atlas Concept Truck Debut from the Detroit Auto Show! For more information on Ford Motor Company's Trucks, check out our 2013 Ford F-150 Brochure, and don't forget that you can save big with our Ford F-150 Rebates!